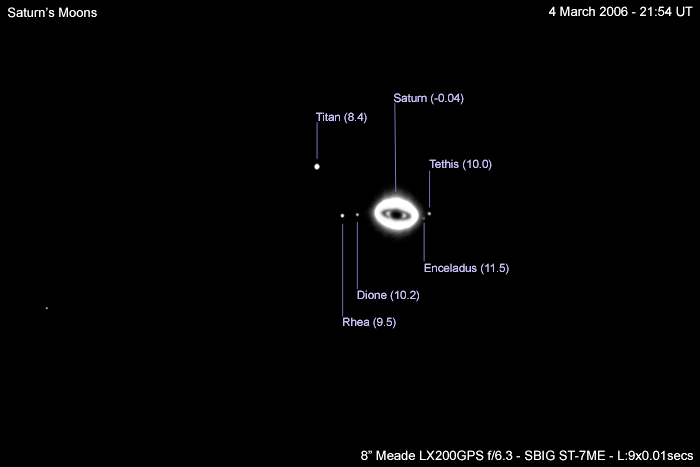 Using a very sensitive CCD camera, a short exposure readily reveals Saturn's moons, as seen here in this annotated image. Bright Saturn is overexposed in this image, and its position is marked by a negative image of the planet from a separate, shorter exposure taken at the same time. Saturn has been the subject of a NASA / ESA collaborative mission, Cassini-Huygens. In January 2005, the European Space Agency's Huygens probe landed successfully on Titan, Saturn's largest moon. Further details and some of the images Huygens took of Titan can be accessed on the ESA Cassini-Huygens website.